د همدې ليدنې کچه: ۴۵۰ × ۶۰۰ پېکسل. نورې ژورليدنې: ۱۸۰ × ۲۴۰ پېکسل | ۳۶۰ × ۴۸۰ پېکسل | ۵۷۶ × ۷۶۸ پېکسل | ۷۶۸ × ۱٬۰۲۴ پېکسل | ۲٬۷۰۰ × ۳٬۶۰۰ پېکسل. 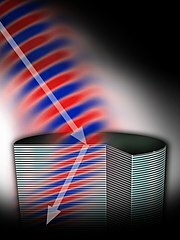 While developing new lenses for next-generation sensors, researchers have crafted a layered material that causes light to refract, or bend, in a manner nature never intended. Refraction always bends light one way, as one can see in the illusion of a "bent" drinking straw when observed through the side of a glass. A new metamaterial crafted from alternating layers of semiconductors (indium-gallium-arsenic and aluminum-indium-arsenic) acts as a single lens that refracts light in the opposite direction.